The facts of the church shooting in Charleston, South Carolina are unfolding. But the deeper causes are like the rotted roots of an abscessed and infected tooth. In the moments after hearing the news, my thoughts went to another racist attack in a church that left four little girls dead and nearly two dozen injured. The four girls killed. 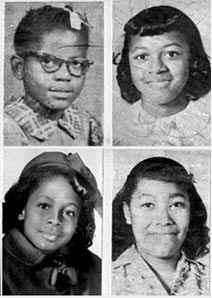 Clockwise from top left: Addie Mae Collins, 14, Cynthia Wesley, 14, Carole Robertson, 14, and Denise McNair, 11. It’s been 52 years since the bombing of the 16th Street Baptist Church in Birmingham, Alabama. But we again have innocent people dead at the altar of injustice. In the years that followed, black people were clubbed, gassed, and attacked by police and subjected to even worse abuses by the public. Racists were hardened, not softened, in the aftermath of the church bombing. And here we are, today. Teenage girls in swimsuits are assaulted by police and the white response is that blacks should be more submissive to their abusers. Here we are: where we exist in our own bubbles of beliefs reinforced by cable channels, talk radio, and websites, no matter how racist or offensive. Here we are: where candid discussions about race are nearly impossible, because white leaders can’t comprehend racism. South Carolina has the Confederate Flag nearly on the steps of the state house; a monument to a racist society that viewed black people as less than human, endorsed by the government, and codified by the citizenry. 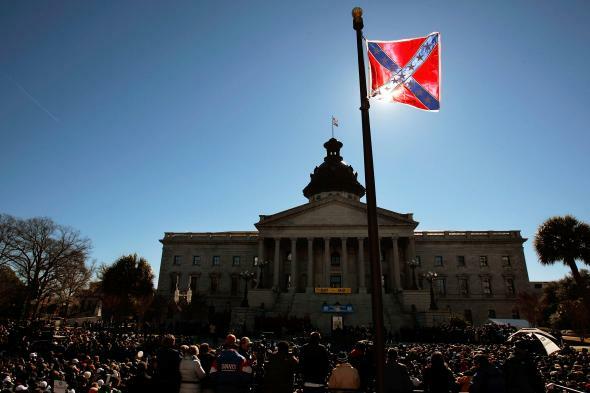 A Confederate flag, part of a Civil War memorial on the grounds of the South Carolina State House, flies over a Martin Luther King Day rally Jan. 21, 2008 in Columbia, South Carolina. Photo by Chris Hondros/Getty Images. That dark part of our history, is here, now, today, where the President of the United States and his family are the target of racist comments in the mainstream culture. What happened in Charleston is racist terrorism. As loud as a bomb and as bright as a burning cross. To fail to acknowledge racism is to abet it. And yet again, our society — with a rotten core built with the labor of slaves — will be unable to see the cause of the killing. A gun facilitated the murders, but a racist emboldened by a racist society, pulled the trigger. God is on the side of the marginalized, the victims. The oppressed. And this was oppression. God is just, but it’s up to us, here, now, to be the instruments of God’s justice. To demand justice and to oppose racism in every form. To pray for the dead and the hurt, and to demand justice, and equality and opportunity for all the oppressed. This entry was posted in in the news and tagged Charleston, Mark Sanford, Martin Luther King JR., President Obama, Racism, South Carolina, US Supreme Court. Bookmark the permalink.